Three thoughts on the Jazz’s 124-123 loss to the Golden State Warriors from Salt Lake Tribune Jazz beat writer Andy Larsen. Don’t let that Jonas Jerebko scored the game’s winning basket obscure the biggest factor behind Golden State’s success: that they have two of the world’s three best players in Steph Curry and Kevin Durant. Both of those players were unstoppably brilliant for long stretches of tonight’s game, dragging the Warriors back through shotmaking prowess alone. This is something that the Jazz have done very well against Golden State in their matchups over the last two seasons; last year, the Warriors shot only 15 and 19 threes, respectively, in two Jazz home wins. They shot 19 overall tonight. That meant that Durant and Curry did most of their work in the mid-range and inside, where the Jazz want them to be. The difference between tonight’s loss and Utah’s wins last year was about Durant and Curry making their shots: some terrific finishes around Rudy Gobert and Derrick Favors, and just some ridiculously phenomenal mid-range shooting. It was wild. Meanwhile, the Jazz did extremely well on the math game: over half of their shots came from 3-point range, and 30 percent more came from within three feet. 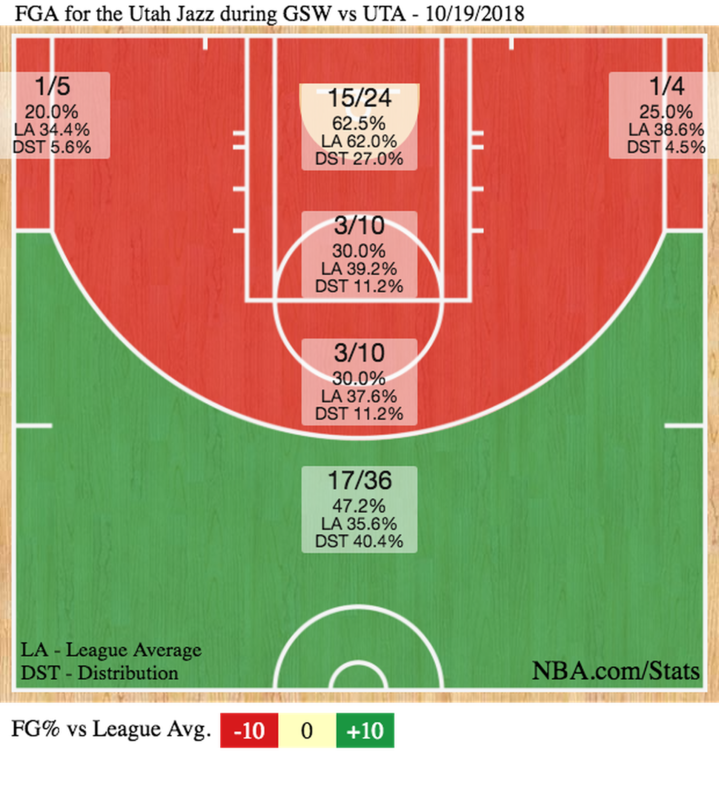 The Jazz converted at a high rate, making 41 percent of their threes and 62 percent of their shots at the rim. I mean, they scored 123 points overall, that’s pretty excellent. It’s just that the all-world talent of Durant and Curry meant the Warriors scored one more. 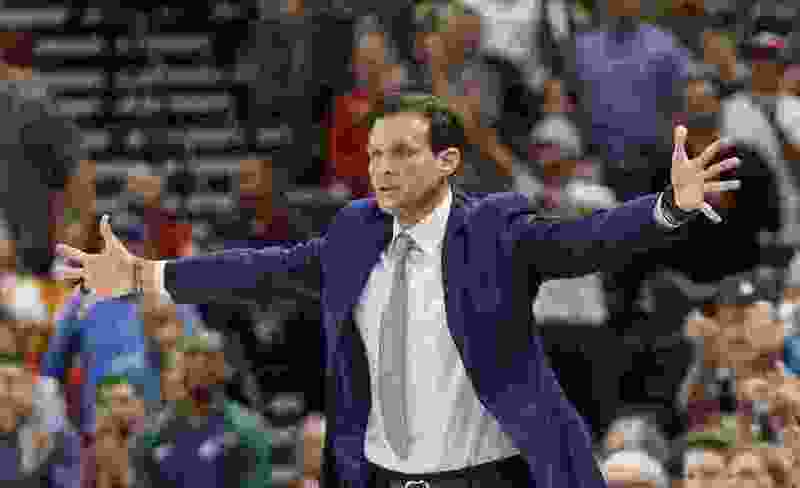 The loss did put a damper on one of the most sensational quarters of basketball ever played by the Jazz: a 47-point masterpiece in the second quarter. It was enough, when added to the Jazz’s good 34-point first quarter, to be the highest scoring first half in Jazz history. They scored 83 points a couple of times in the late 80s and early 90s, but both of those happened in a second half, where end-of-game fouls and free-throws make it a lot easier to see high-scoring point totals. This quarter, though, was just due to some absolutely bonkers 3-point shooting. The Jazz hit 10 of 16 threes in the quarter; their previous high in a quarter was eight. If you want to get particular, it was really just one stretch of hilarity: the last seven minutes. In those first five minutes of the quarter, the Jazz only scored nine points. Boring. In the last seven minutes, they scored 38 points, hit 10 threes, added a dunk and a layup, plus four free throws. They only didn’t score on three plays, which was more than made up for by hitting way, way too many threes. The Jazz’s offensive rating for seven minutes was 211! 211 points per 100 possessions! The sun is 27 million degrees Fahrenheit. The Jazz were hotter. It was just phenomenal basketball to watch. To be honest, a few of them aren’t great 3-point looks: Exum’s initial one is fine, but not in rhythm, Ingles and Mitchell both had contested step-backs. But many of the Jazz’s good looks came because they pushed in transition, then took advantage of the open man to hit the open three. That might be repeatable, and it’s something Joe Ingles (a team-high 27 points) mentioned in the postgame: the Jazz aren’t just trying to push off of misses and turnovers anymore, they’re trying to push after opponent makes too. They jumped to 25th in the league in pace last year, through two games, they’re at eighth. Small sample size theater, maybe, sure. But sometimes small-theater plays make it to the big stage. But the Jazz didn’t execute late in the game. In the final three minutes, they scored only two points in six possessions, and those two points came from a fluke rebound that happened to bounce to Jae Crowder. I thought the Jazz executed well on two of those possessions: a Donovan Mitchell attempt in which he drove impressively around Durant, then just missed the layup; and a good look at three for Ingles, taking advantage of a crack in the Warriors' switching defense. The last possession was the most important, of course, but the Jazz panicked while setting it up. Watch Crowder at the end of the video, yelling at Ingles, who seemed to be in the wrong spot earlier in the play. That forced the Jazz to run a fake screen play essentially designed to get a switch for Mitchell, but Durant’s a very good defender and not very exploitable. Mitchell still probably should have driven, but it wasn’t a good look. On other possessions, it would have been good to see Mitchell try to do a little bit less, working to find his hot teammates instead. 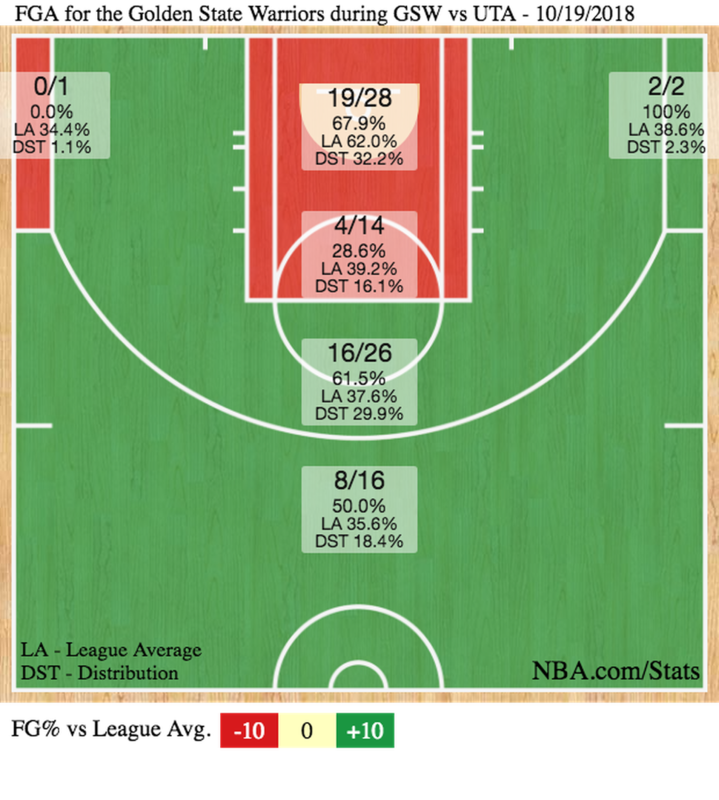 Mitchell’s 7-23 shooting performance was the crack in the armor of an otherwise efficient game all around by the Jazz. As for Jerebko’s tip-in, well, I’m not sure there’s a lot of blame to assign there. Sure, more Jazzmen could have crashed the glass, but I’m not sure they’re getting there from the perimeter. Crowder and Gobert were both trying to contest Durant’s shot, and while Gobert was too far away, that tendency is probably a good one. It’s a very smart rebounding cut by Jerebko, and a healthy dose of luck for the ball to fall to him and that the tip rattled in.